Community Supported Agriculture (CSA) is a partnership between farmers and consumers. CSA members join a farm early in the season by purchasing a share of that farm’s products in advance. In return, members get a weekly share of fresh fruit or produce from the farm, which they can pick up on the farm or at other locations in the community. Farms have been using the CSA model for a few decades, and there were over 3,000 shares sold locally in 2018. With conventional produce, you may be unsure about the farming practices on industrial farms which can be energy- and chemical-intensive. 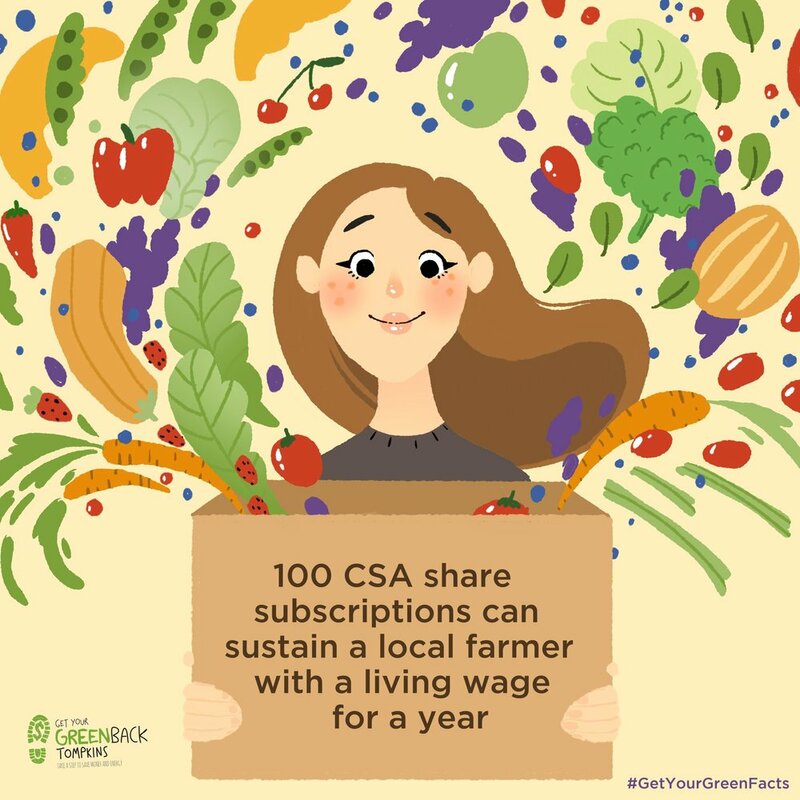 However, when you buy a CSA share, you can be sure that you are supporting local farms that manage the land in a sustainable manner — avoiding synthetic pesticides and fertilizers (many farms are certified organic or use organic methods), diversifying crops, and building up organic content in the soil. Eating more vegetables is at the heart of healthy living, and CSA gives you an abundant weekly share! Produce on local farms often contains a higher nutrient content than those grown industrially, as produce begins to lose its nutrients soon after harvest. In addition, the produce in CSA shares are often organic, and there is little to no use of chemical fertilizers and pesticides in many of the farms, which means fewer potentially harmful chemicals in your food. Approximately 100 CSA shares can support a full-time farm worker for a year. Farmers get full value for their produce, and 100% of the cost goes directly to the farmer (as opposed to selling through a supermarket, where farmers may get 50%). In addition, money spent on CSA is more likely to stay local and support the local economy. Many farms in the area operate with the CSA model, and there are many pick up sites all over the greater Ithaca area, including various farms, Ithaca College, Cornell University, Press Bay Alley, and Greenstar. Learn more about various sites in the 2019 Area CSA Farm directory produced by CCE-Tompkins. CSA can be less expensive than buying the same type (e.g. organic) and amount of food in a supermarket. One study (Cooley & Lass, 1998) showed an average of $260 savings per CSA share compared to equivalent produce in a supermarket. In addition, Healthy Food For All (HFFA) provides subsidized CSA shares to low-income households, covering 50% of the cost (or more). Farmers initiated HFFA a decade ago to give food-insecure neighbors the opportunity to be nourished by the high-quality fruits and vegetables grown in their community. Learn more here. Find out more about CSA here.